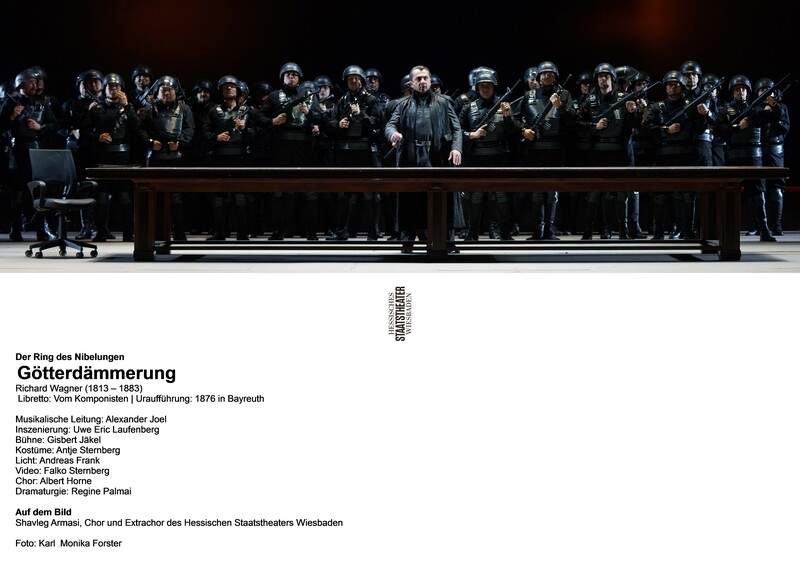 Extrachor des Hessischen Staatstheaters Wiesbaden, Chor des Hessischen Staatstheaters Wiesbaden, Hessisches Staatsorchester Wiesbaden / Alexander Joel. Stage director – Uwe Eric Laufenberg. Hessisches Staatstheater Wiesbaden, Wiesbaden, Germany. Monday, May 1st, 2017. 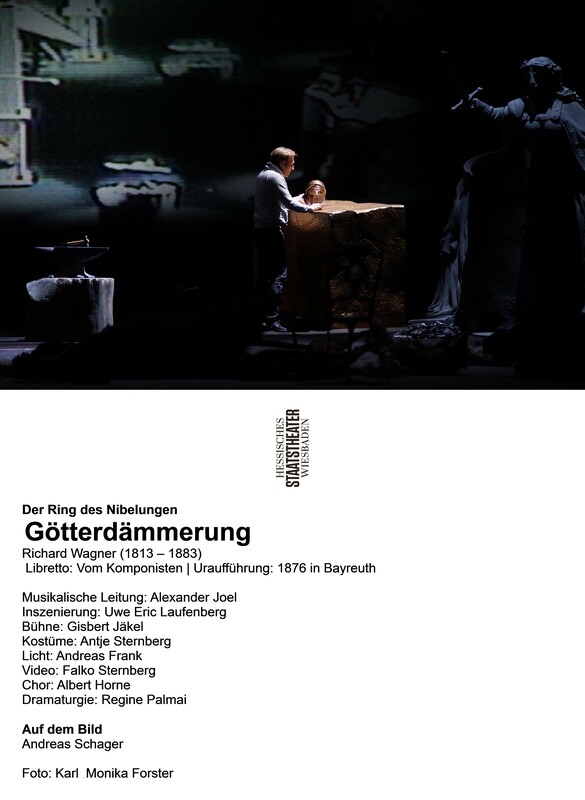 I returned tonight to the Staatstheater in Wiesbaden for this final instalment of the inaugural cycle of their new Ring. As with Saturday’s Siegfried, I will make the same disclaimer in that it may be that I am at somewhat of a disadvantage not having seen the first two chapters in Uwe Eric Laufenberg’s production. 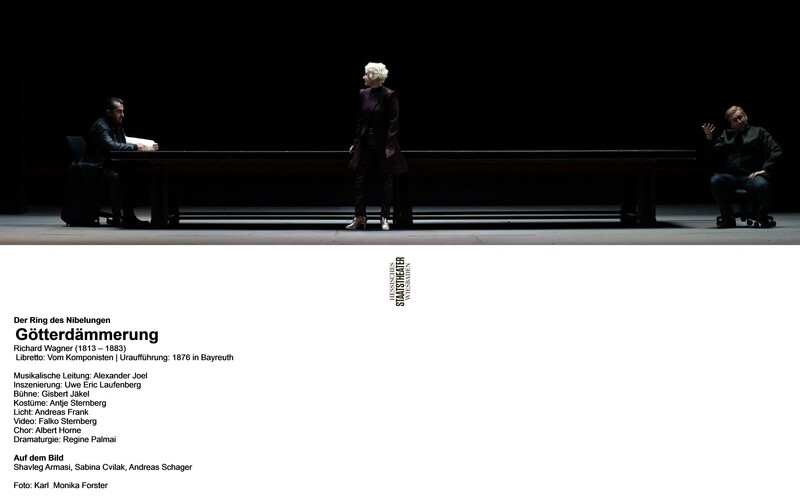 When I saw Andreas Schager in the Flanders Tannhäuser in 2015, I tweeted at the time that I would love to see him in a Götterdämmerung with Evelyn Herlitzius in a small house. Tonight is testament to the fact that sometimes, wishes do actually come true. Laufenberg played this Götterdämmerung relatively straight. This was very much a domestic drama, definitely of this world. We first see Brünnhilde and Siegfried living in domestic bliss in a tastefully-designed chalet. Brünnhilde packs Siegfried off to the Gibichungs’ who are costumed in that familiar proto-fascist uniform of leather trench coat for Gunther and military uniform for Hagen. I’m not quite convinced that we truly get a sense of who the characters are and the universe in which they inhabit. As in the Siegfried, personenregie was problematic with much staring at the floor and standing and delivering to the front. The direction of the chorus involved them perambulating on and off in formation. As I said, it certainly plays the story straight and unobtrusively, helped by the uniformly excellent diction of the entire cast. Some of the singers fared better than others in building their characters – Bernadett Fodor’s Waltraute was vividly sung but was just parked in the middle of the stage and sang to the front. Samuel Youn’s Gunther seemed to spend most of the evening raging at an invisible spot on the floor. It goes almost without saying that Evelyn Herlitzius gave us a fully rounded and lived-in Brünnhilde – even when standing still and declaiming to the front, she was absolutely magnetic. Often when something is possible doesn’t meant that it’s necessary and again, in common with the Siegfried, the use of video was inconsistent. The closing scene felt like something of an anti-climax – Brünnhilde running off to stage right while waves drowned the Statue of Liberty and fireballs raged through Manhattan. After the sheer white-hot intensity of Hertlitzius’ immolation scene it felt flat. 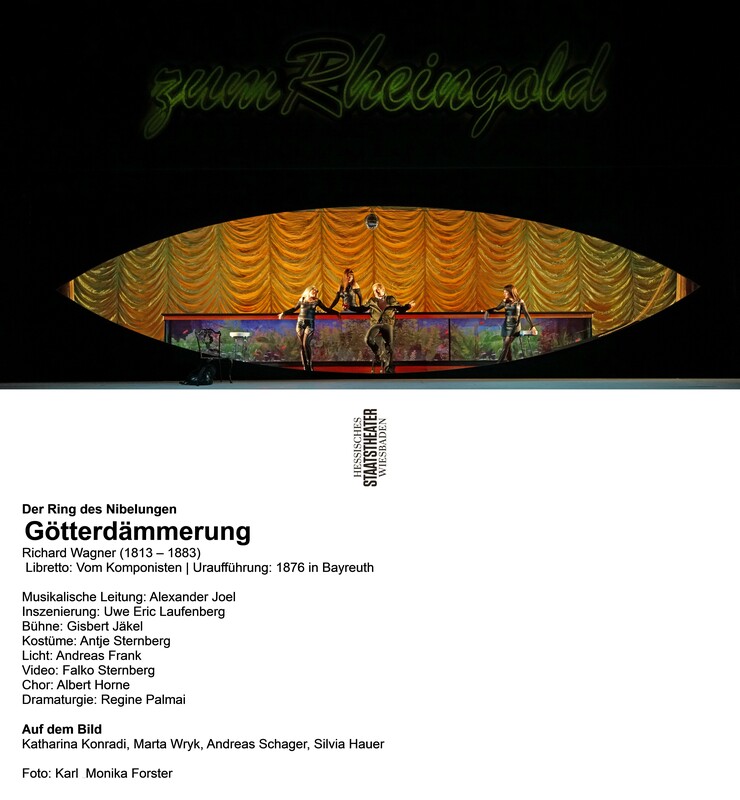 Similarly, the Rhinemaidens were dressed as cabaret girls at the Rheingold bar, but (and I admit this could be as a result of missing the Rheingold) it felt disconnected and separate from the remainder of the narrative. Schager is undoubtedly the heldentenor de nos jours. His security is staggering and he is absolutely tireless. His opening duet with Herlitzius was mind-blowing – both producing seemingly superhuman levels of volume, riding the orchestral tumult emerging from the pit like it was the most natural thing in the world. Schager is a singer I admire immensely, however, the fact that he’s able to produce the volume doesn’t mean it’s necessary to use it. Previously I have found him to vary the use of dynamics. Perhaps it was tonight’s character – hardly the most subtle personality – but I found him tonight to be singing virtually everything at an unrelenting fortissimo with the result that, towards the end of the evening, pitch started to become somewhat approximate. Schager is a phenomenal talent, undeniably gifted and I would travel a long way to hear him, but I do wish that he had brought more light and shade to the role this evening. Shavleg Armasi was a very late replacement for the originally-cast Albert Pesendorfer’s Hagen and a most welcome one. He is the owner of a youthful bass so that he could conceivably be Alberich’s son. The bottom doesn’t quite have the theatre-filling low notes of some other interpreters but no doubt these will come with time if he looks after his instrument. The voice has tremendous amplitude and sounds completely healthy. 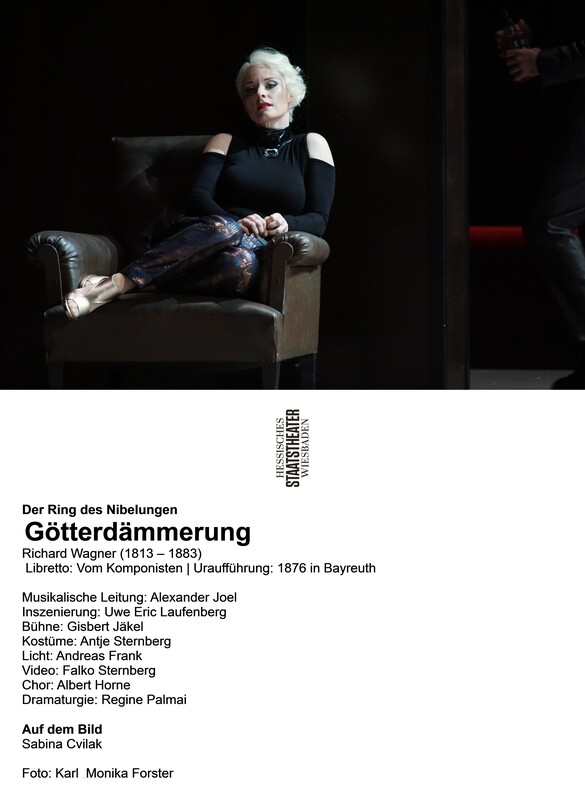 Youn raged powerfully as Gunther, his baritone absolutely even from top to bottom. Sabina Cvilak was a diamond-toned Gutrune, the tone slightly narrow but had plenty of cutting power and was even in emission. Fodor’s Waltraute was sung in a resonant mezzo with nice warmth in the middle but with quite an obvious register break. The top is impressive however and I’d certainly like to hear her again. Thomas de Vries repeated his round-voiced Alberich, nicely insinuating. Then there was Herlitzius. As with her Elektra, it’s clear that she also owns the role of Brünnhilde. She gave us the entirety of her character’s journey from eager lover to betrayed soul. Everything she does is through the text – the words are always crystal clear, however dense the orchestration. Seeing her being thrown to the floor as Gunther/Siegfried steals the ring was harrowing. Likewise her despondency as she was dragged into Gibichung Hall by Gunther was heart-breaking. The resolution she found in the immolation scene was inspirational. There will be those, as always, who won’t be able to look beyond the odd stray note but those really are a small price to pay for the sheer psychological insight of watching her live a role and give us all of what she has. Vocally, Herlitzius was on good form tonight, despite being audibly tired toward the end. The womanly, all-encompassing warmth of her middle register and firm bottom always give pleasure, but it’s the remarkable way the top opens up gloriously that says with me, filling the theatre in ecstatic waves of sound. The strength that she found as she accused Siegfried was overwhelming. Tonight I felt privileged to see a great artist at work. The gentlemen of Albert Horne’s chorus made a tremendous noise as Hagen’s Vassals – they must have been heard on the other side of town. The orchestra also demonstrated how much progress they have made through playing this Ring. Yes, there were some ragged chords, some brass slips and the occasional patch of raw string intonation but again, nothing Londoners don’t hear regularly on Bow Street. They played their hearts out for Alexander Joel and they were rewarded by him inviting them to the stage to receive their ovation from the audience. Joel once again gave us conducting that was urgent and vital. His was a very swift reading – although he did allow tension to sag somewhat in the interlude just before the scene with Waltraute. He brought out the twilight half-lights in the score but also brought out the visceral impact of the Trauermarsch. Thanks to his vital conducting, the evening flew by in a heartbeat. There really is something incredible in hearing two of the world’s biggest voices soaring and riding an orchestra in the way that Herlitzius and Schager did tonight. Experiencing the building vibrating with the power of the unamplified human voice gives one such an exhilarating feeling that it certainly brought a tear to my eye. Tonight was most certainly intelligently cast and very well sung and conducted. The production left me somewhat neutral and certainly the closing moments did feel somewhat anticlimactic. Despite that, this was without a doubt a major company achievement for Wiesbaden. It was superbly sung, with every word clear, fluently conducted, respectably played and with high production values. There is one more cycle with this cast at the end of the month. If you can, go. Ah, this sounds fantastic! Thanks for the thorough and vivid report. Currently gnashing my teeth while wondering why I haven’t yet heard Schager or Herlitzius live.